Across the waste of waters she calls and calls to me. And round her feet are lying the dying and the dead. I haste to thee my mother, a son among thy sons. The speaker in the poem gives an oath to serve and protect his country. If that calling is war, he goes to war. Joseph Smith wrote in his letter to John Wentworth, an editor of the Chicago Democrat newspaper, these words: “We believe in being subject to kings, presidents, rulers, and magistrates, in obeying, honoring, and sustaining the law.” Wherever we live, we should honor and obey the laws. Yet, there is another country that requires greater commitment and devotion. This country is spiritual. It’s ruler is our Lord and Savior Jesus Christ. He is its King. It is not protected by walls of stone but by faithfulness and love. It is a country of peace. A number of English poets wrote of spiritual countries and themes. Another of my favorites is by William Blake. His poem Jerusalem was set to music and is the national hymn of England. In the poem Blake questions if the Savior’s golden feet ever walked upon England’s green mountains and pleasant pastures. These words are stirring and powerful. Did Jesus ever walk upon England’s ground? He might have. We read in 3 Nephi: “And verily, verily, I say unto you that I have other sheep, which are not of this land, neither of the land of Jerusalem, neither in any parts of that land round about whither I have been to minister. For they of whom I speak are they who have not as yet heard my voice; neither have I at any time manifested myself unto them. But I have received a commandment of the Father that I shall go unto them, and that they shall hear my voice, and shall be numbered among my sheep, that there may be one fold and one shepherd; therefore I go to show myself unto them” (3 Nephi 16:1-3). Jesus said that He was going to show Himself to others who were not in the land of Jerusalem or in the Americas. I believe some of those others He visited were from the lost tribes of Israel who were scattered into the north countries and across the face of the whole earth (see Ether 13:11). Many within the lost tribes (and some who were not “lost”) ended up in England. To them the Savior may have come. His divine countenance may have shone forth upon the clouded hills of England. Blake also calls for the building of Jerusalem upon England’s hills. This is similar to the early Latter-day Saints who sought to establish Zion, a New Jerusalem. It was to be built in Missouri (but was not due to persecution) and someday shall be built in Missouri. We can build Zion wherever we live by building our lives upon righteousness. As we strive for and are blessed with purity of heart we will discover that Zion is no longer fled (see Moses 7:69) but stands on the rock upon which we build (see Matt. 7:24 and 3 Ne. 14:24). Yes, someday a literal Zion shall be built in the Americas and the city of Enoch will return from whence it was taken, but in the meantime, Zion is wherever the Saints of God, especially the pure in heart, dwell (see D&C; 97:21). As I was growing up, my family went rappelling fairly often. My father had spent a lot of time climbing when younger and had developed a great love of rappelling. It was not long after I first tried it that I loved it. I remember the first time I went rappelling. I was about 8 years old. The rock we went down was not large – maybe 20 feet tall – but to an eight year old, it was daunting. I was able to make it down under the reassurances of my father and family. It wasn’t long before I went down without hesitation. There is something thrilling about bouncing down a cliff at a high speed. There were times that I would jump down 20-30 feet in a single bound, relying on the friction between the rope, my hand (when I planned on going down that quickly I wore a leather glove), and the figure-8 (a metal device that the rope slides around) to keep me from falling to quickly. I even tried going down head-first, which is not recommended if you have a serious fear of heights. [Image by Rescue Dog]. Rappelling is a dangerous activity. Yet, if proper safety measures are taken, it can be quite safe. When we went rappelling, my father made sure we were safe. Whenever possible, he would tie the rope(s) to two anchor points so that if one failed, there would be backup. We used to tie our own harnesses using nylon straps but we preferred to use manufactured harnesses. All harnesses were checked and re-checked to make sure they were on properly. We would use two carabiners to connect to the figure-8 (that the rope went around). These carabiners were set so the gates were on opposite sides. Whenever possible we would use at least one carabiner with a locking gate. As an added measure of safety, we would have someone at the bottom of the cliff who belayed. Belaying is a climbing term to describe the controlling of a rope. If someone were to slip down the cliff out of control, the person belaying at the bottom could pull the rope out away from the cliff and stop the person on the rope. They can also help guide the person rappelling down the cliff. Rappelling is safest when there is a person at the top guiding the person on their journey down the rope as well as someone belaying at the bottom. Over time rappelling ropes wear thin. The tough outer layer of the rope can weaken with the friction of the people going down the rope as well as when it rubs against the rocks. 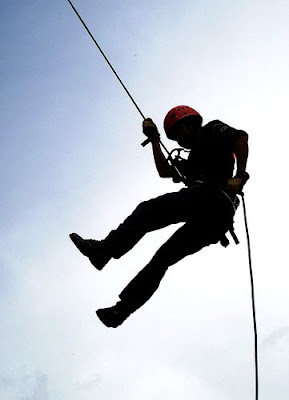 Rappelling ropes are incredibly strong – they can hold thousands of pounds of weight and force. However, they become unsafe if their integrity is compromised. As is rappelling, so is life. Life can be and is very dangerous but it can be a lot of fun. However, to survive – physically and spiritually – we need to establish safety guidelines and procedures. We need to establish them early and follow them. Others can guide us and help us remain safe as well. We have parents and prophets who can teach us correct principles. We can have safety in our personal lives, our homes, and within the gospel of Jesus Christ. We can find safety within Zion, the spiritual place where the pure in heart dwell and the physical city where the saints of God will eventually live. “And it shall be called the New Jerusalem, a land of peace, a city of refuge, a place of safety for the saints of the Most High God; And the glory of the Lord shall be there, and the terror of the Lord also shall be there, insomuch that the wicked will not come unto it, and it shall be called Zion. And it shall come to pass among the wicked, that every man that will not take his sword against his neighbor must needs flee unto Zion for safety.” (D&C; 45: 66-68). As we anchor ourselves to the rock of Christ and follow the prophets and scriptures as our safety guides, we will be safe even as we experience some of the harrowing heights and even the thrills of life. “Zion is defined by the Lord as the ‘pure in heart.’ The Lord said, ‘… let Zion rejoice, for this is Zion—THE PURE IN HEART; therefore, let Zion rejoice, while all the wicked shall mourn.’ (D&C; 97:21). “Since Zion is defined as the ‘pure in heart,’ those who make up Zion must be free from worldly practices and indulgences. “President McKay referred to Zion as the pure in heart and said: ‘… the strength of this Church lies in the purity of the thoughts and lives of its members, then the testimony of Jesus abides in the soul, and strength comes to each individual to withstand the evils of the world.’ (Conference Report, October 1911, p. 58. )” (James A. Cullimore, “To Be in the World but Not of the World,” Ensign, Jan. 1974, 119). President McKay’s statement is profound: “The strength of this Church lies in the purity of the thoughts and lives of its members.” That places a large responsibility upon each of us. We just learned what Enoch and his people accomplished! They were all pure in thought and thus one with each other and the Lord. Because of this they were taken into Heaven. If we are pure in thought and heart, we may be received, sooner or later, into Heaven.